Smart and Simple Playard - Moreland is rated 4.8 out of 5 by 23. Designed with parenthood in mind.™ Cozy, Convenient, and Clean! The Smart and Simple Playard™ from Ingenuity is a dream come true! The Dream Centre™ is the perfect place for newborns to rest or play thanks to soft fabrics, breathable mesh and a toy bar with adorable toys. The tasteful Moreland™ fashion suits boys or girls and looks great in any home. The Flip2Stow™ elevated changing table makes diaper changes more comfortable for both you and baby, and it flips easily out of the way when not in use. Side storage pockets help keep you organized and all baby's needs within reach. Three washable pieces keep baby's environment clean. The DreamCentre™, mattress, and changing pad can be removed in minutes to go into your washing machine. 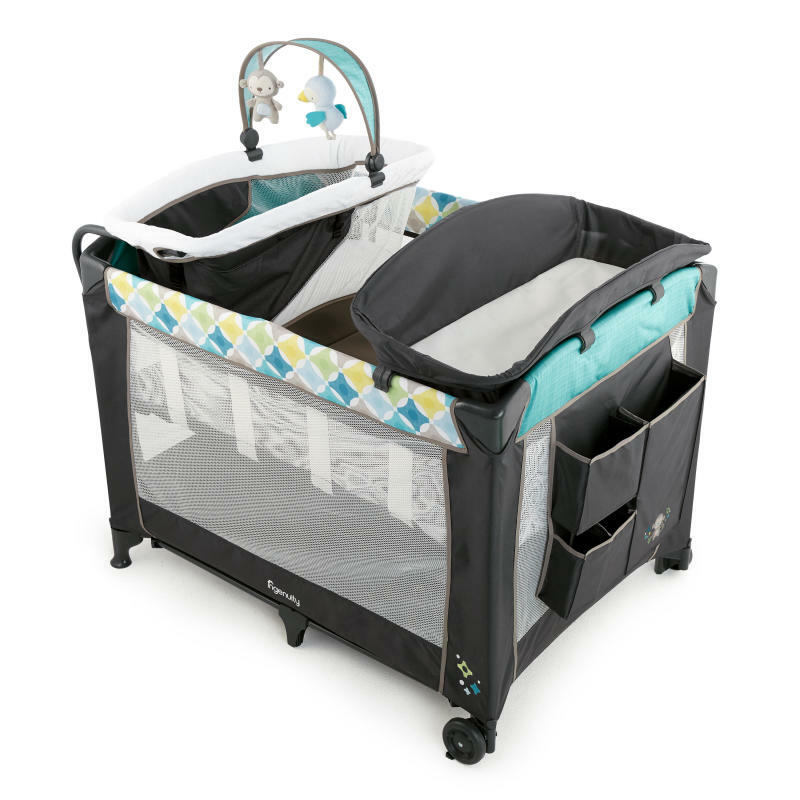 OneLessStep™ feature allows this playard to fold fast (without removing the bassinet) to make transport easier on you. Travel bag included. Three easy-wash pieces: mattress, DreamCentre™ and changing table. Dimension (in) 29" x 40" x 28.25"
Rated 1 out of 5 by Whitney hayes from unfortunante & disappointed Did not recieve ! The father of my child purchased this product from walmart and expecting and realizing that i did not recieve the changing table bag .. i might be missing bars i dont know just really mad because he purchased this to make my family happy particularly because its suppose to grow with the baby. Rated 5 out of 5 by Rrenno from Versatile and convenient playard! This playard has been extremely convenient for our family from the day our baby boy was born. We were able to use it as a bassinet, changing table, crib/sleeper and playard. 10/10 would recommend this playard for moms who have limited space for lots of bulky products, as this serves many uses in one. Rated 5 out of 5 by Lori11479 from Great Features and easy to set up! I received this product to review. It was very easy to assemble and set up. The bassinet attachment feels sturdy and is very soft. There is a changing attachment and it is lined with plastic making clean up easy. There is also a caddy attached to the side that is perfect for storing diapers, wipes and extra clothes. Rated 5 out of 5 by Sarah88 from Love this! This has been so convenient for us! We love it. It’s easy to put up to use and easy to take down and store. I love the “Dream Centre” part, it’s perfect for our new baby. It’s so soft and cozy. It is removable if you don’t want to use it or for when baby outgrows it. The elevated changing table is pretty handy and just flips out of the way when you’re done. There’s a storage compartment conveniently located on the side next to the changing table, right in arms reach! It has wheels so it’s easy to move around the house and comes with a carrying bag for traveling and storing. The mattress, changing pad and dream centre can all be removed (easily) and thrown right into the washing machine. Rated 5 out of 5 by Sarah88 from Love this! This has been so convenient for us! We love it. It's easy to put up to use and easy to take down and store. I love the "Dream Centre" part, it's perfect for our new baby. It's so soft and cozy. It is removable if you don't want to use it or for when baby outgrows it. The elevated changing table is pretty handy and just flips out of the way when you're done. There's a storage compartment conveniently located on the side next to the changing table, right in arms reach! It has wheels so it's easy to move around the house and comes with a carrying bag for traveling and storing. The mattress, changing pad and dream centre can all be removed (easily) and thrown right into the washing machine. Rated 5 out of 5 by Cassandrakalal from Ingenuity Smart & Simple Playard I received this product and hands down it became one of my favorites! The assembly on this playard is so simple and quick! I took it with my on my vacation with my twins. We had it set up within 5 minutes! Everything snaps together with breeze. Setup is pretty self explanatory, even for new parents! The bassinet is amazingly soft!! It's so comfortable, I wish I could crawl in! The changing station is convenient with an easy to clean and sanitize pad. Another great benefit of this playard is the easy to wash pieces!! Rated 5 out of 5 by Crystalb2286 from Great multi function play yard I love the features of this play yard I am one who uses a play yard instead of a bassinet in the first few months with a new born so to have a play yard with the bassinet attachment & changing table are lovely features! I love that the bassinet cover is completely washable you can remove the support board to be able to wash the basinet cover which is always helpful with newborns. I was not a fan of the changing table part as it’s a bit hard to get on & off of the play yard. Overall the play yard is easy to assemble it took less than 30 minutes to take out of the box & assemble & disassemble. The only issue I found with taking the play yard appart was the basinet & changing table features weren’t very easy to break down for storage once assembled and the changing table part was a little difficult to remove from the play yard, the basinet comes off very easy with the push of a button! The pieces are easy to store!